Jennifer L. Holm, Author: SQUISH: GAME ON! Do amoebas and video games go together? And what is mitosis? 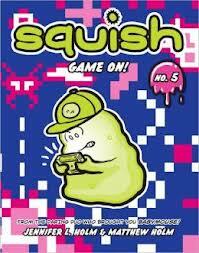 Find out in: SQUISH #5: GAME ON! Look in the back to find out how to draw one of the Squish characters! Also includes instructions for a sensational science experiment you can do at home! Coming to stores (and ponds) everywhere May 28th!